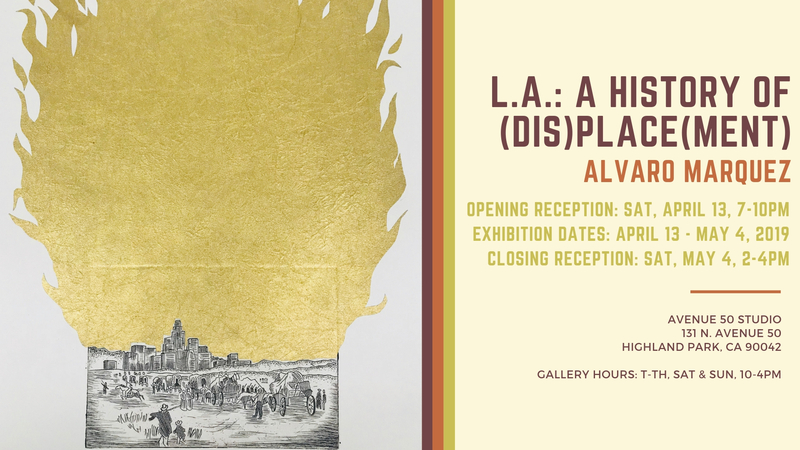 Avenue 50 Studio presents “LA: A History of (dis)Place(ment),” by Alvaro Marquez. This exhibition will be held in our Annex Gallery. Please join us for the opening reception of the show on Saturday, April 13, from 7-10PM. Light refreshments will be served. Free admission, valet parking available during the opening, or we are located walking distance from the Highland Park Metro Gold Line Station. Gallery Hours: Tuesday-Thursday, Saturday & Sunday, 10-4PM. History is often reimagined and contested in the popular imagination through visual media of all sorts. Moreover, much of our engagement with the past happens beyond the purely written word; we learn about and engage with the past through images that circulate in various media, and find ways to situate our experiences in a historical context. Oftentimes, the work of the historian is to piece together layers of information to create a coherent narrative that explains how and why we have gotten where we are. As an artist with an interest in the past, I use my previous training as a historian to find a mode of creative production that taps into the collective constant re-imagining of the past. My goal is to exercise my own historical imagination and disrupt the notion that writing is the only, or primary, way of producing historical knowledge. My current artistic practice is invested in thinking about the long history of displacement in the Americas, dating back to the arrival of Europeans in the continents, to current problems with gentrification. This visual body of work is an attempt to explore the ways in which displacement has been a key part of the development of California generally, and in the Los Angeles Basin in particular. Central to these concerns is the fact that much of these issues started with a battle for control over water, soil and people, as well as the eventual efforts to construct an extractive economy that derived surplus value from the labor of raced others and the extraction of natural resources. The presence of, or allusions to, soil reminds us that the privatization of land and natural resources has roots in the colonial encounter, and that current efforts to stop gentrification are rooted in a struggle over who “owns” land (itself a colonial construct that runs counter to indigenous notions of land stewardship). As a decolonial gesture, an effort to imagine another set of relations to land and society, this body of work reminds us that our perception of history is always fraught with ideological and political concerns. Historically, various print media and technologies have been central to the dissemination of Western knowledge about the “New World,” and later the supposedly “Wild West,” through the publication of traveler’s accounts, maps, and sensationalist boosterism. My work draws inspiration from this cannon of the Western historical imagination, and utilizes cartographic social abstraction as a means for developing an art practice that insists that art-making is a way of thinking about history and our place in it. Álvaro D. Márquez is a printmaker and educator based in Los Angeles county. He is originally from the working class immigrant community of East Salinas, California. His practice engages questions of history, visual culture, and displacement. He holds a BA in US History from Brown University and an MA in American Studies and Ethnicity from the University of Southern California, and is currently pursuing an MFA in Printmaking at California State University, Long Beach.